Catherine Parr-Traill (née Strickland) was born in 1802 in Bungay, Suffolk, England. She was the second youngest of six sisters, five of whom would become writers (see Susanne Moodie). They were all taught at home, and had free run on the family library, which was very extensive. Because of the family’s relative isolation, the children would often pass the time reading and writing. Catherine was particularly interested in nature, and this interest appears in her children’s stories. She wrote nearly one children’s story per year while she was still living in England. 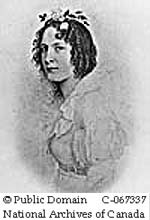 Before emigrating to Canada 1832, Catherine published The Young Emigrants, or Pictures of Life in Canada in 1826. She based the book on letters that she had received from friends and family who had already emigrated to Canada. In this book, Catherine championed the British duty to expand the Empire, the adventurer’s spirit as well as a stable domestic life and family solidarity. In 1832, she met Thomas Traill and they were married immediately then set off for Canada. Life in Canada was difficult for the Traills, as their farms failed and investments went south. Her husband sank deeper and deeper into depression, while Catherine supported her family (she had seven surviving children) through her writing. The Backwoods of Canada was published 1836 and was a commercial success. It is a collection of letters that Catherine wrote chronicling her new life in Canada. The spirit of adventure and British resolve, reappear despite her less-than-ideal situation.